Each day is met by the same reports: electoral interference has supposedly taken place, instigated by Russian, or at the very least outsourced Russian entities, in the elections of Europe and the United States. Such claims assert, not merely the reality of these claims, but the nature of their influence. Such a stance detracts from one fundamental point: that the manipulation of electoral systems has been, and remains, common fare, irrespective of the finger pointing at Moscow. The shock has been towards the modern nature of that interference, capitalising on hacking as a key feature. 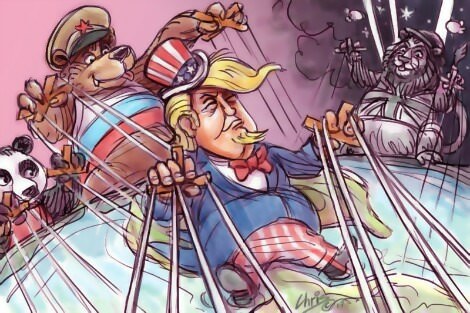 The United States, where claims of Russian influence remain the most notable and jagged, has not only been a key instigator of electoral disruption in other countries, even to the point of overthrowing elected governments, but a previous recipient of that fact. On the latter point, Britain can stake an important claim to pioneering the copybook of local electoral interference, a strategy it undertook with some dedication in 1940. In 1999, a history commissioned by Canadian Sir William Stephenson, chief of British Security Coordination responsible for Secret Intelligence Services operations in North and South America (1941-5), was declassified. The history shed light on the committed efforts of Prime Minister Winston Churchill's government to create a formidable apparatus of propaganda and influence within the United States, designed to sway the opinions of Americans against neutrality in favour of the British war effort. Tactics to that end involved the illegal interception of enemy communications on US soil, the infiltration of unfriendly labour unions and the funnelling of radio and print propaganda sympathetic to Britain's plight through networks in the United States. According to Steve Usdin there were 'perhaps hundreds of Americans who believed that fighting fascism justified unethical and, at times, illegal behaviour'. Usdin provides a reminder that Britain's Secret Intelligence Services were adept at using their own variant of fake news and smear campaigns against candidates sympathetic to the 'America First' line. "Global powers with the means and capability to alter the so-called trajectory of history through electoral interference, tend to do so." Such an influence of the political trajectory, the argot of interference in the political mechanisms of other states, has been at the forefront of US foreign policy for decades. In a mild variant, it finds form in the financial ventures of the 'civil society' projects of the National Endowment of Democracy, channelling funds to dissident groups. Then come instances of more overt uses of force and sabotage in the Middle East, Latin America and Africa, often with disastrous consequences to the local populace. More often than not, this entailed the direct overthrow of populist leaders, often democratically elected. In 1953, Iran got a hefty taste of Anglo-American interference that ultimately saw Prime Minister Mohammed Mossadegh overthrown in 1953. The Pahlavi dynasty proved the greatest beneficiary. In 1961, the removal and murder of Congolese leader Patrice Lumumba set the stage for a reign of looting and terror in the guise of a Washington-friendly Mobutu Sese Seko. Even as Russia is accused of meddling in the current French presidential campaign, the CIA has been found, via documents released on WikiLeaks, to have been involved in conducting espionage orders in the lead-up to the 2012 election. These documents, available from the CIA Vault 7 Series, reveal efforts to infiltrate all major French political parties using human (HUMINT) and electronic (SIGINT) spies seven months leading up to the presidential election. Orders included obtaining the 'Strategic Election Plans' of the Union for Popular Movement Party, and a set of questions for analysts. Note was made of 'Sarkozy's level of confidence in his ability to contest the election, and how he and his advisors interact'. None of these instances of history ever justifies sovereign breaches by one state into the affairs of another. But the privileging of a single power as being singularly nefarious, unique in effect and influence, is misplaced. Global powers with the means and capability to alter the so-called trajectory of history through electoral interference, tend to do so. A more salient point is how resilient the targeted country is, and the actual effect such interventions have. I agree with Binoy, there is a very high level of hypocritical nonsense in the allegations coming out of the US about interference in the recent US Presidential election. There is NO doubt in my mind that the CIA was involved in the conspiracy that brought down the Whitlam Government in 1975. There is ample evidence that the US was alarmed when Whitlam won in 1972 that we might withdraw from the Alliance or close down Pine Gap and other US spy networks in Australia . Their record in Central and South America was terrible. The CIA behaviour during the Vietnam War was despicable ! Interesting article, and no surprise. Britain has a dark history of propaganda; the distorted coverage of the 1916 rising given to the US press as an example; and Churchill "set up" the sinking of the Lusitania, the most obscene PR event in history. It got him what he was after, none the less. Dear Binoy, your article makes some good points but it suffers from a classic basic flaw of a false moral equivalence. Winston Churchill was trying to draw the USA into the most important moral crusade of the last 1000 years, against the freakish evil of Hitlarite fascism. The USA was at the times you quote fighting the similar evil of Soviet totalitarianism, even if in retrospect some of their targets were off beam. In general the USA and the UK were on the side of the angels. On the other hand, Putin`s vicious, murderous, kleptocracy regime certainly is not, and what we have seen is a frontal attack on one of the best systems of governance even devised.